JACKSON, Miss. (AP) — For Mike Espy, a high-profile woman helped Espy make the argument Saturday that the Democratic man would be a better choice in Mississippi’s U.S. Senate runoff for the state’s women. But the Republican woman in the race, Cindy Hyde-Smith, will get support from the party’s highest-profile figure — President Donald Trump — as she makes her closing argument before the Nov. 27 election. It’s a race that has grown more heated in the last week as video emerged of Hyde-Smith praising a supporter by saying: “If he invited me to a public hanging, I’d be on the front row.” Hyde-Smith said that was “an exaggerated expression of regard.” She has counterattacked against Espy by pointing out that he lobbied for a later-deposed African leader who’s now on trial for crimes against humanity. “Not every woman is for women,” he said, drawing a contrast with Hyde-Smith, the first woman to ever represent Mississippi in Congress. Appointed to the Senate seat by Gov. Phil Bryant after Sen. Thad Cochran retired, the Republican wants voters to see the race through a different lens in a state that hasn’t elected a Democrat to the Senate since 1982. Espy won a larger share of women’s votes in the first round of voting on Nov. 6 according to VoteCast, a survey of the electorate conducted by The Associated Press. 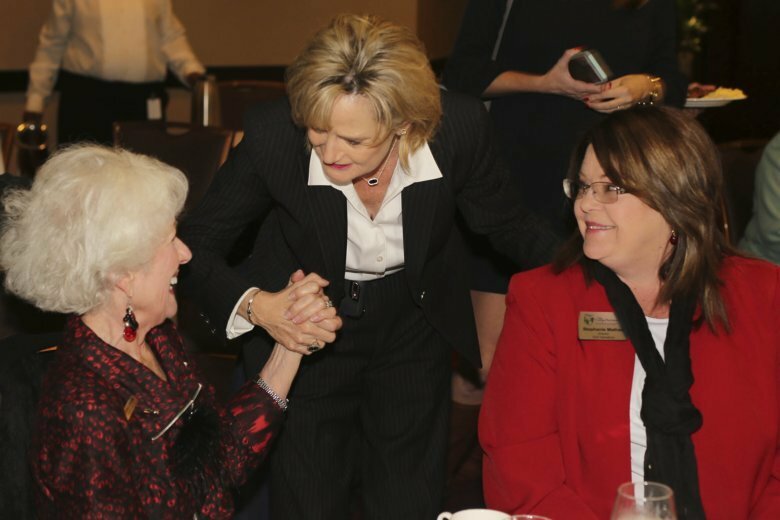 Of female respondents, 43 percent said they voted for Espy while 33 percent said they voted for Hyde-Smith. There were two other candidates in the election. The share of men’s votes was flipped, with Hyde-Smith winning 41 percent and Espy winning 34 percent, VoteCast found. That reflected a similar gender split nationwide. Democrats argue that a high turnout among women, especially African-American women, could deliver an upset victory to Espy, in the same way that black women were the bedrock supporters of Democrat Doug Jones’ Senate victory in Alabama. Many of the same advisers who worked for Jones are working for Espy. For example, Harris went on Saturday to speak to door-to-door canvassers working for Espy. Espy isn’t shying away from the support, saying there are differences but also shared interests.